It was typical to slide your beret under your combat shirt epaulet when it wasn't on your head (circa 1980-ish). It's been 'a few' years since I last did it and can't recalll...was it under the left or right epaulet? I'd be curious to know which unit authorized that. edstorey wrote: I'd be curious to know which unit authorized that. I couldn't say whether it was authorized but it was wide spread in Toronto/Ontario militia units. Not in the two Ontario Militia units I belonged to, how sure are you that it was that 'wide spread'? The other question I have to ask is since the Combat Shirt pockets were quite voluminous, why would anyone tuck their headdress in an epaulet when it was possible to secure it quite nicely in a pocket? edstorey wrote: Not in the two Ontario Militia units I belonged to, how sure are you that it was that 'wide spread'? The other question I have to ask is since the Combat Shirt pockets were quite voluminous, why would anyone tuck their headdress in an epaulet when it was possible to secure it quite nicely in a pocket? The two units I belonged to did it, as did the one (artillery) unit that I was seconded to. So did the rest of the units in both armouries I dealt with (plus those attending Meaford and Pet summer camps as well, but my recollections could be dim on that point). Of course those voluminous pockets you speak of held FNC1A1 magazines as they were intended to. That was what was in your pockets, right? when I was in the reserves as well as reg force, I always put my beret in my epaulet. A lot other personal did too, some senior NCO's frowned upon it. Me being left handed I always put my on the right side, but I have seen them on either side. In Western Canada most would put the beret in the right cargo shirt pocket, but when I went to CFB Borden at the CFSAL I noticed many did the epaulette thing, if you were right handed you would use the left epaulette. Apparently putting your beret in a flap has been around for a while. 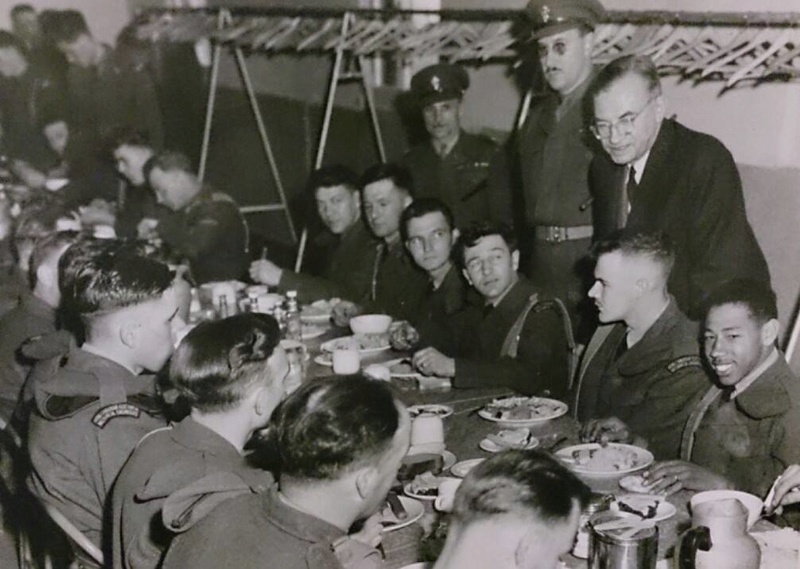 I found a photo for soldiers eating a meal in the Kingston mess hall. In the picture shows soldiers with the beret in left and right shoulder flaps.